Mirror neurons are the topic of today’s behavioral economics podcast. We are really going to get into what they are, how they work and why they matter in any business. Mirror neurons are the key to empathy and our ability to learn from observing others instead of only by doing things ourselves. Mirror neurons have done some amazing things for all of humanity – first of which is our ability to learn by observation and second is our ability to empathize. 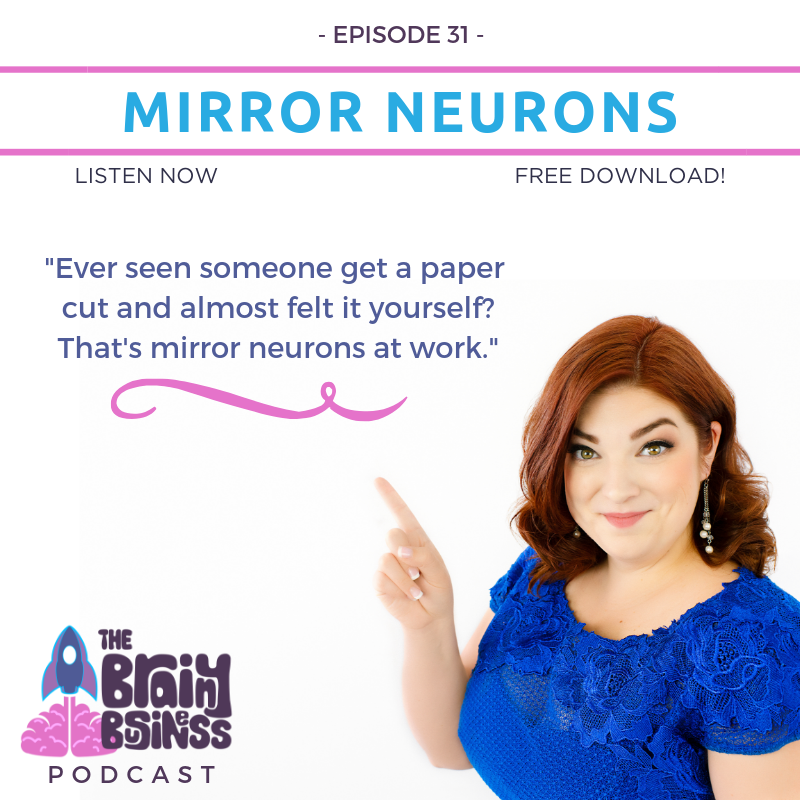 In this episode I explain the accidental discovery of mirror neurons, and talk about learning by observation, our other senses, facial expressions and empathy. I also include a lot of additional resources for further learning and explain how this knowledge can be applied to any business. [03:52] Mirror neurons are the key to empathy and our ability to learn from observing others instead of only by doing things ourselves. [04:21] Mirror neurons were discovered in the early 1990s. The whole thing happened by accident when scientists noticed that a monkey’s brain lit up when one of the researchers walked into the lab eating an ice cream cone. [06:32] We humans have mirror neurons as well, and they greatly impact our lives everyday. [06:47] Mirror neurons have done some amazing things for all of humanity – first of which is our ability to learn by observation and second is our ability to empathize. [06:55] We humans tend to take for granted how quickly and easily we learn things simply by watching others. This isn’t something every species can do. [07:46] Without mirror neurons, life as we know it would not exist. [08:08] Mirror neurons are how the species learned to hunt, gather, farm, build homes, and all the skills we use every day. [08:26] The collective intelligence of the species grows very quickly as one person learns to do something because others can watch and have their brain behave as if it has already done it once before. [08:45] We each have 100 billion neurons in our brains and each of those has 1,000 to 10,000 contacts with other neurons forming associations. [09:36] Mirror neurons are actually found in one spot in the brain – in the frontal lobes. The front of the brain is also home to our ordinary motor control neurons. [10:51] A study found that the mirror neurons were more active when the context was included – meaning both intentions and actions matter and relate for mirror neurons. [11:03] Mirror neurons will not respond to random, meaningless gestures – it has been found that they are specially connected to respond to actions with clear goals. [11:46] The processing of the senses actually happens in the brain. Because our brains bring context, interpretation and analysis to everything we experience…it turns out they don’t really know the difference between what is physically in front of us, versus on tv, or a print ad, spoken into our ears or read in text. [12:54] Mirror neurons are what allow us to experience drinking spoiled milk when we see someone else do it. [13:55] Seeing things is the best way to trigger mirror neurons, but the other senses will trigger them, as well. [14:10] When someone smiles at you, your brain brain reacts as if you are smiling too. [14:32] You don’t have to be consciously aware of what’s happening, you just do it. [15:29] The response of mirror neurons is quick, intense, and automatic. [15:44] Mirror neurons may well be at the core of how we understand the actions of others and empathize with them. Without mirror neurons, we would probably not have any awareness of the actions, intentions and emotions of others. [17:38] All that separates us from other people and experiencing the same things they are experiencing at every moment they are within our proximity…is our skin. [17:53] This is why people with phantom limb syndrome can be helped by watching someone else get a massage. [19:45] Mirror neuron therapy helped a couple whose baby had a stroke at 10 days old regain body control on his left side. I’ve linked to the touching TED Talk. [21:16] BUSINESS APPLICATIONS – Video is effective. When you can show someone taking the action you want your customers to take, it makes it easier for them to follow suit. [22:54] Any time you can get someone to see another person experiencing your product, it is good. HOWEVER you need to be very careful of the facial expressions and all the slightest nuances of the person in the video. [24:44] If the subconscious can fill in the gaps when presented with a few images…that is important for using mirror neurons. [25:07] Our mirror neurons allow us to relate to what is being displayed in the pictures and we fill in the gaps to make sense of what we are supposed to do. [25:33] A well produced story with all the RIGHT details is better than a drawn-out, verbose explanation any day. [25:46] Great storytellers can hold conversations well. Our brains allow us to experience the words in the story as if we are participating ourselves. [25:57] Include action words and partner them with matching gestures to help the audience come along with you. [26:29] When you can activate mirror neurons, you are helping the individual to familiarize themselves with your brand, story, product or process. [26:57] Be aware of your actions and facial expressions even when you aren’t speaking. [27:25] Smile genuinely, be interested, and be inviting whenever you’re in a room with people. [28:14] To attract positive customers, you may need to try a shift within yourself. [30:30] An experiment was done with an honesty snack box at a workplace. They tried different images and the one with eyes on it encouraged people to put more money in than those with flowers. [32:20] Showing your potential customer someone using the product in the same way you want them to is a great way to activate mirror neurons because it combines an action with intention. [33:20] Consider the actions and intentions to use mirror neurons to the best of your ability. What’s So Special about Mirror Neurons? Mirror neurons are so powerful. This is something I talk about with parents of teens. How you greet your teen, with a smile or a frown, can impact them in so many ways. It’s also a reminder that we are role modeling for our kids and their brains are soaking it up. Thank you for the wonderful research and examples about how mirror neurons impact our daily lives. Fascinating. Thank you Sheri! I am glad you enjoyed the episode and that you are sharing it with your own clients – that’s awesome! And, yes, you bring up a great point that every little thing matters. We as parents (and in life in general) need to know how our moods and the little looks or things we say can impact those around us and our reputations more than we know. Thank you again for listening and commenting!